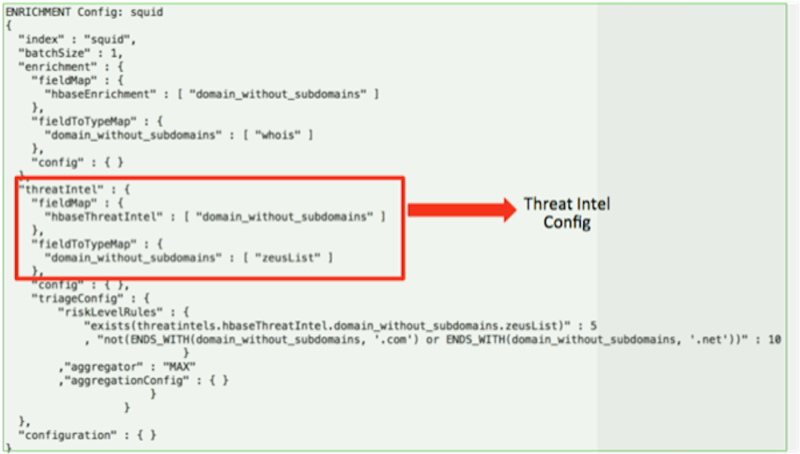 After you define the threat intelligence source, threat intelligence extractor, and threat intelligence mapping configuration, you must run the loader to move the data from the threat intelligence source to the Metron threat intelligence store and to store the enrichment configuration in ZooKeeper. Log into $HOST_WITH_ENRICHMENT_TAG as root and navigate to $METRON_HOME/config. This command modifies the Squid enrichment config in ZooKeeper to include the threat intel enrichment. HBase column family to ingest the data into. This must be column family t.
JSON Document describing the enrichment configuration details. This is used to associate an enrichment type with a field type in ZooKeeper. The number of threads to use when extracting data. The default is the number of cores of your machine. HBase table to ingest the data into. The data is populated into an HBase table called enrichment. Generate some data to populate the Metron dashboard.